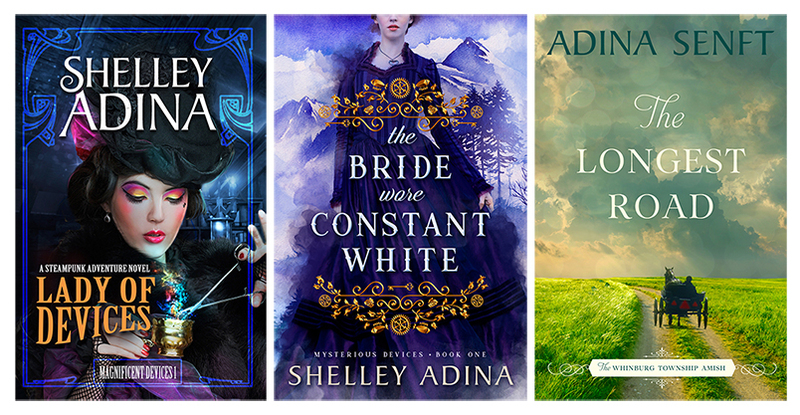 Shelley Adina is the author of 24 novels published by Harlequin, Warner and Hachette, and a dozen more published by Moonshell Books, her own independent press. She writes steampunk, contemporary romance, and young adult fiction, and as Adina Senft, writes women’s fiction set among the Amish and other plain communities. Host Patricia McLinn talks with Shelley about writing in multiple genres, using past experiences, and even overcoming bullying. Thanks to DialogMusik for the instrumentals that accompany this podcast. Authors Love Readers, hosted by USAToday bestselling author Patricia McLinn, is a weekly conversation between authors about how and why they create stories. With questions contributed by readers. Quite a few podcasts are out there for aspiring and established writers, both on the craft and the business. This podcast, though, is for readers. The goal is to have authors on the show who write in all sorts of fiction genres. As a reader, it doesn’t matter which path to publication an author takes – independent, traditional, hybrid and other combinations. That’s not going to matter on Authors Love Readers, either. McLinn is the author of about 45 novels, including her ongoing murder mystery series, Caught Dead in Wyoming. She also writes romances – mostly contemporary, but there are a few historicals, women’s fiction and non-fiction titles. She had 27 books in 25 years in traditional publishing. Having secured the rights back to a number of her earlier books, she began indie publishing in early 2010. That made her officially a hybrid author, since she also still had books under traditional contracts. In mid-2015 she left the final traditional publisher and has been happily 100% independent since. And thank you to DialogMusik for the instrumentals that accompany this podcast!